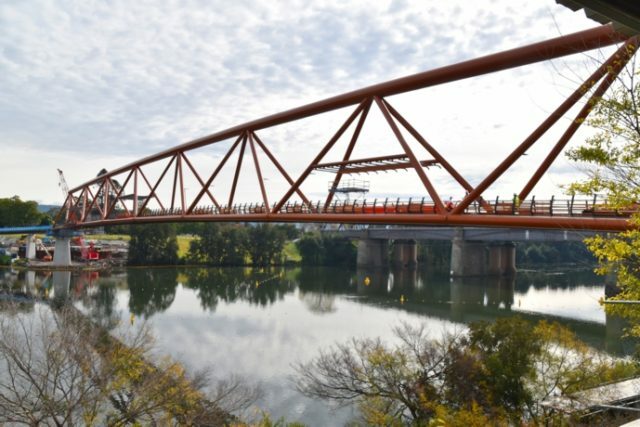 Work is continuing to power ahead on the new pedestrian and cyclist bridge across the Nepean River at Penrith with the community now invited to have their say on a name for the nearly completed bridge. Penrith MP Stuart Ayres said the new bridge is now all the way across the Nepean River, with crews continuing to carry out work on either side of the bridge to complete the project. “With work on the pedestrian and cyclist bridge inching closer to the finish line, it’s now time for the community to put forward some name ideas for the bridge which will provide a safer crossing for years to come,” Mr Ayres said. “Choosing a name can be challenging but the community is encouraged to think about names which best describe the bridge including commemorative names or names which have geographical, historical, community or Aboriginal significance. Mr Ayres said the categories are consistent with acceptable standards as outlined by the Geographical Names Board of NSW. “Naming categories are available on Roads and Maritime Services’ website to provide the community with guidance on the type of names which will be considered,” Mr Ayres said. “Once open, this pedestrian and cyclist bridge will become a local landmark for the Nepean region so we want to ensure the community has a chance to suggest some potential names. Naming suggestions for the new bridge are invited by Sunday, July 29 and can be provided by emailing nepeanbridge@rms.nsw.gov.au or via rms.nsw.gov.au. The community is asked to provide their suggested name, the naming category it fits into and reasons for why it would be an appropriate name for the new bridge. “A number of milestones for the bridge have been met this year and the naming is just another step towards providing the newest piece of active transport infrastructure in the region,” Mr Ayres said.